Your first time at uni is a scary and exciting time and at Avondale our aim is to make sure each of our students gets the most positive experience from Avondale. 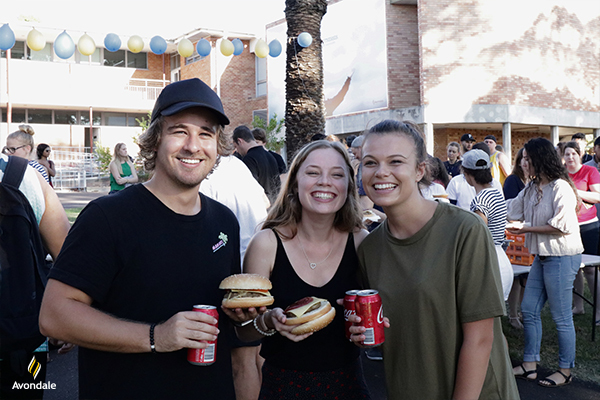 O week has been developed over the years to allow students the chance before the assignments start coming in to get acquainted, make friends, gets your bearings and have fun. Unfortunately, at a lot of institutions O week gets a bad rep. O week at Avondale is all about allowing students to have fun in a safe environment to start off their uni years positively. Avondale’s O week was just that. With a team of staff and students organising events throughout the week to encourage the holistic lifestyle we offer at Avondale there was something for everyone. The workshops for new students to attend were designed to get them up to speed with uni life. They learnt how to reference, manage time, avoid plagiarism and even how to manage their finances. The workshops were designed to give students the head start they need to be successful in their studies. Basketball is life at Avondale so what better event to start off the O week activities then a friendly social game of mixed basketball. It’s a great taste-test of what sporting life is like at Avondale and allows students to experience the importance team sports have in helping them to make new friends, get some physical activity and be part of something more than just classes. The talent of our students is never-ending. Music brings people together and it’s no different at Avondale. There are so many different styles of music represented at Avondale and each student has the opportunity to showcase their talents and style at variety hour and have fun performing to their fellow peers. Free dinner, free gelato, free movie by the pool… need I say more! Twilight pulse bought a variety of different stalls on-campus for the students to spend some money on little goodies to remember their first week. A free dinner was provided to all staff and students to welcome them, followed by free gelato at the pool with a movie played at moonlight. Circus-themed speed friending was always going to intrigue and bring students together. It was a great night to meet so many students and learn more about each other. Some students don’t know anyone when they arrive on campus so the ASA (Avondale Student Association) team made it a priority to make sure no student went ‘unfriended’. Featuring The Peter Dixon Band, this event was a night not to be missed. After 28 years the students still look forward to the most anticipated event of the year. They dress up, show off their country music dance skills and finish off the week with lots of laughs and plenty of Instagram shots. No matter how rusty your dance skills are, this event never disappoints and will continue to be a highlight of O week at Avondale for many years to come. Not everything comes to an end. Throughout the semester there are ongoing sport competitions, variety hours, social events and even academic workshops to be a part of so the fun never stops. Welcome to all our new and returning students. We hope you have an enjoyable prosperous year at Avondale. Start experiencing Avondale via our snapchat ‘avondalexp’ and our hashtag #avondalexp. How does a degree actually work?